﻿ New Cyanide Detection Test: "A game changer..."
Collecting marine ornamental fishes for the aquarium trade using cyanide administered from a squirt bottle. Photo: James Cervino/NOAA. In the past two weeks, a series of online articles have been making the social network rounds once again highlighting destructive fishing practices in Indonesia—one of two countries from which the vast majority of marine aquarium animals in the North American trade originate. The focus of these articles is largely dynamite and cyanide fishing in the high profile Northern Komodo National Park, a World Heritage Site off-limits to most fishing. While the illegal destructive fishing practices occurring in Komodo are largely based on food fisheries—especially the live food fish trade—there remains anecdotal evidence about ongoing cyanide use in marine aquarium fisheries in countries like Indonesia and the Philippines, which lack transparency, as well as the requisite resources necessary for effective fisheries management, enforcement and education. While the instances of destructive fishing practices used to target marine aquarium animals pale in comparison to what is going on in food fisheries, this by no means takes the marine aquarium trade off the hook for continuing to support unsustainable fishing. Unfortunately, while many initiatives and efforts have been attempted over the years, the aquarium trade has lacked the will to put an end to cyanide use once and for all, leading some observers to become disheartened and pessimistic about the possibility of real reform. A new technique to detect cyanide in reef fishes along the entire supply chain is poised to change all that. Although illegal in many places, cyanide use remains prevalent because it is both cheap and highly effective. To collect fishes using this method, fishers use a squirt bottle containing seawater mixed with sodium cyanide or potassium cyanide. The fisher then sprays the hydrogen cyanide at target fishes underwater. The target animal is stunned by the chemical and is then easily collected. While many cyanide-collected fishes make a short-term recovery during holding in fresh seawater before delivery to the export facility, a significant number die either on the reef or on the boat as a direct result of acute poisoning. To add insult to injury, cyanide-related mortality, often unidentified as such, continues as the fish moves along the supply chain. In some cases, a direct correlation is suspected between cyanide-use at point of collection and mortality weeks later in the aquarist’s tank. In addition to fish mortality as a result of cyanide use, significant collateral damage occurs to the surrounding reef as a result of breaking coral to extract stunned fishes or direct poisoning of coral and other invertebrates in the vicinity of the targeted species. While it is possible to test for cyanide in fishes, the most effective tests are time-consuming, must be used within a relatively short window post-cyanide exposure and require the animal tested to be sacrificed. Given the landed value of the animal, as well as the current protocols employed by most market country wholesalers, there has been little incentive for the wholesaler to employ comprehensive cyanide screening at the time of import. Likewise, the cost of such testing, not to mention the logistics and existing market dynamics, mean that source country export facilities also have little incentive to screen for cyanide use. While fisheries managers and government entities intent on better managing source country fisheries may have the incentive to put an end to illegal cyanide use, they often lack the requisite resources to make it so. While no doubt wholesalers and others along the supply chain are negatively impacted by cyanide collection in the form of fish mortality, the current economics of the trade continue to justify, for many, turning a blind eye to cyanide collection. The result is that the real losers remain at the extremes of the supply chain: the ecosystems and animals impacted and the aquarists who lose animals due to factors over which they have no control. 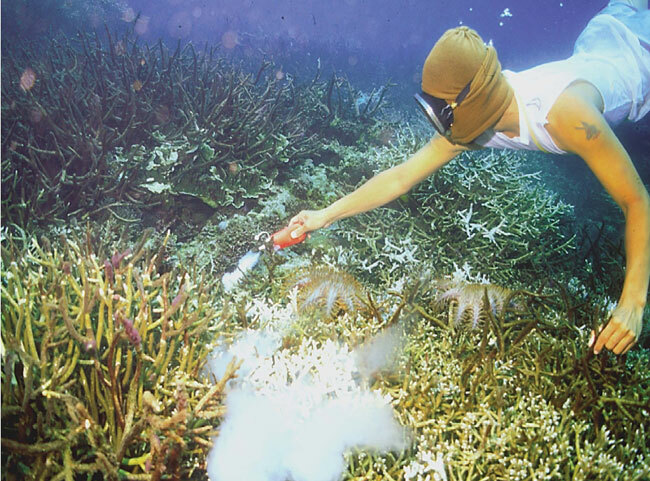 While the situation is disheartening at best, individuals, organizations and governments concerned about the impacts of cyanide fishing to reefs and reef organisms—as well as aquarists who value healthy, sustainably collected animals—have newfound cause for optimism based on a non-invasive, non-destructive test for cyanide in marine aquarium fishes recently published in the open access journal PLoS ONE. Unlike other cyanide detection tests, the new methodology provides for rapid detection of cyanide by testing the water in which the animal is being held. The procedure outlined in the paper utilizes an optical fiber sensor capable of detecting trace levels of Thiocyanate anion in seawater. Since nearly 80 percent of all cyanide entering an organism is converted to Thiocyanate anion and excreted in urine, this procedure allows for quick, non-invasive screening for cyanide by simply testing the holding water. Because saltwater fishes retain Thiocyanate anion for long periods subsequent to the initial cyanide poisoning, this cyanide detection method can be used successfully throughout the supply chain. Rhyne believes there are several excellent options for using this technology in import countries like the United States. For example, random inspection of importers would be easily accomplished using the new protocols, which could become the foundation for a certification scheme for those importers wishing to market cyanide-free fishes. In addition, this new tool could be used behind the scenes by importers wishing to assess their own supply chains and audit their suppliers. Readers who would like to know more are encouraged to read the paper, which is available for free online at PLoS One. We welcome any feedback or comments, and we’ll be bringing you more on this important development in future articles. Also, stay tuned for Ret Talbot’s field reports from Indonesia next month. In addition to research associated with the Banggai Rescue Project, he will also be looking at destructive fishing practices, which are reportedly rampant in the Banggai Islands.